We are grateful to the otd.kr community that allowed us to use their DSA 1.75 stepped key tooling for this group buy. Thanks guys, you rock! DSA family, this ain't your standard key set, if you don't know what it means, read this whole post! This is a group buy for DSA family spherical keycaps. DSA is a medium profile keycaps family (PDF of Signature Plastics reference) with spherical top. To my knowledge there have been very few (if none) GBs for this family of keycaps. Keys are all on the same profile (0-degrees angle) which means that you can place any key in any position (the are no rows like in standard DCS family). This makes them suitable for custom keyboards and unconventional layouts (dvorak, colemak, ...). This is not your usual set of keycaps, be sure to understand what you are buying. Colors are inspired by the Commodore 64, hence the "Retro" naming. PS: I've been asked for additional colors (namely white on blue). If this GB gets a very high volume of orders we may add more colors. Here what you can buy. There are a lot of options but don't worry, I developed a web app to make ordering very easy, see below. This is all you need for "standard keyboards", just remember to add a spacebar (6.25 Universal for the usual sospects). NOTE: Left stemmed keys are in DCS Family not DSA! NOTE: Left stemmed keys are in DSA Family! NOTE: NO 1 unit keys included, you have to buy them separately! NOTE: No duplicate keys! If you want 2 ctrl, 2 alt, 2 super, ... you need to pick 2 of each! Blank keys for every need. Remember to pick a space bar. At the moment all blanks are Brown. We may add more colors, but don't hold your breath. I might run a separate group buy for this set for main European languages, but only if there will be enough ISO Kits sold. This might your only chance to get a full ISO layout for spherical. Signature Plastics initially said that they couldn't provide DSA spacebars, but they contacted me back saying that they actually have them! I've just updated the order form with the new space bars. If you already placed your order, I'm not going to automatically switch your DCS spacebars to DSA because the DCS ones might still be needed for certain keyboards. 6 units DSA: 3 mount points. 1 centered, 2 at 38mm from center. 6.2 units DSA: 3 mount points. 1 centered, 2 at 50mm from center. This has the standard Filco and the like mounting position. 7 units DSA: 3 mount points. 1 centered, 2 at 57mm from center. This is mainly for winkeyless. 6 units DCS: 3 mount points. 1 centered, 2 at 38mm from center. 7 units DCS: 3 mount points. 1 centered, 2 at 57mm from center. There's no reason to get this spacebar anymore being the 7u DSA a perfect alternative. If you don't know which one to take, look at the back of your spacebar and measure the distance of the stems. I would recommend taking a couple of spacebars in different families (it's 2 bucks at high tiers). This would save you unpleasant surprises! Anyway we will be taking some spares, just in case. For this group buy I've set up a special web application. When you send your order you'll be given an Order ID, write it down somewhere, with that ID you can review, change or delete your order at any time. No need to ask me to do it for you. You can also save the order ID on your browser as a cookie for easy access. If you lose the Order ID, you can simply resend your order, the previous one will be overwritten! With your order ID you can also follow the cost of your key caps based on the current tiers. I'm taking care of the kit layouts, interest check, group buy, contacts with Signature Plastics, replying to questions in this thread and so on. samwisekoi (located in the US), will collect money, place the order with SP and send keys to all of you. I'm located in Europe, so if it's cheaper we might find some way to collect/split orders between the continents (both for payments and shipping). - What are relegendable keys (code blk100r)? - What additional blanks do I need for ErgoDox? 1-unit it's up to you, up to 20, but you can take the 1-unit modifiers and/or the Extra kit and in that case you'd need less blanks. - Are we going to have plum modifier kits and blanks? We are discussing with samwisekoi the feasibility. Not in this first round. - Are we going to have white on blue? Same as above, we are discussing it with samwisekoi right now. The GB already reached very high tiers, but it is actually up and running only since 3 days! We have incredible things ready for the next round! Woohoo! I'm in! Thanks to everyone who is making this happen. Ordered pretty much 1 of everything. Cheers for making this happen, I'll be back tomorrow! Ordered only the basics atm but who knows what I'll add in the future. Wow I really like this. Very tempting. That's like everything I ever wanted in a keycap. Is there a closing date or is this a wait and see? Everything about this is amazing. Matt3o for R5! This is one of the slickest group buy orders I've run across. I guess it's appropriate, for the nicest group buy set I've seen. And in! Very awesome form! I put a preliminary order in that will probably get edited at least once. I like how you've single handedly raised the bar on how to run/manage a group buy. Looking good and I'm excited. Hope it runs for a couple months so we get some nice prices. Really, really nice order form. In addition to Extended Alpha Kit 1, what other keys would be necessary for an ErgoDox? True or false: blanks only available in chocolate. Alright! Glad to see this move from IC to GB I'm in... big time. Very pretty indeed, decided to go for one, may give up quest for Dolch. thanks to everyone for the compliments, I spent quite a bit of time on the order form and the gb status page. If there's interest and brown ones reach good tier I might add red blanks. Maybe you already explained this before, but how come they want so much for the tkl? Do they have to make new tooling? Prices will go way down as quantity goes up. 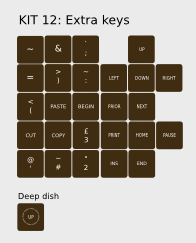 the TKL contains many 1.5 and 1.75 additional keys which are exponentially more expensive. It's not a simple TKL kit, you can do winkeyless and ctrl/capslock switch with the same kit. The goal is to reach at least 50 tier at $50 it's a pretty attractive kit. This will make me sound very sad but there are little 3 keys with a £ sign and little 2 keys with a " to buy. This makes me strangely happy. Just ordered. Compliments on the automatic GB system. A++. Blows 7bit's system away. ordered this and a new set of pants. I'm spent. You should of bought two for when they come in as well! Also, can someone post the stem configurations of the four space bars? For example is the 6.25 a 6-stem universal? What do the two 6-unit ones look like? Brown 1x1 blanks seem to have already hit top tier. I'd be up for moving some of mine to a plum or lime. Matt3o, I thought you were going to fold ISO into the main kit so it doesn't have MOQ issues like in every group buy? SP does MOQ by color and profile. So 200,000 ANSI enter keys plus 20 ISO enter keys has the ISO enter keys priced with Qty=20. What a beautifully set out Order Form, especially love the small pictures to show what we're buying. Very nice. I have to say, I'm addicted to this key-set. I thought that maybe it couldn't get any better looking but Matt3o you out did yourself. You are indeed a key-set artist. It's not what you include in the key-set but what you left out and combined to achieve a very balanced colour layout and feel for this old-style of keys. It's mature/adult and very refined in it's execution without it falling into a children's style of colours and fonts which is usually typical. The colours you chose remind my of a "Cherry-Ripe" chocolate bar distributed here in Australia. The cherry is deep in colour and the coffee looks like dark chocolate. W O W ! ! ! Raise the bar much? Seriously impressed, oh and I ordered as well. I think he meant that the "base" kit would include the keys from the ISO kit, and raise the price of the base kit a few dollars. So that the 20 or so ISO users get what they need without paying a lot for it, and everyone else pays more for the base kit, and gets keys they don't need. Not that this will affect my order, but there is no "GEEK HACK" key in this set is there? Ironically, to outfit a typical 104/108 (one basic set, one modifier set, one C64 set, one tenkey, and one spacebar) currently costs far more than most of the boards you'd put them on. The price will come down, probably WAY down in most cases. When we get past the 50 tier, it gets much better. Also remember that this is a boutique set. It is going to be visually striking, and the keyboard will seem pedestrian in comparison. Of course, each one is a different setup for the machine. That is essentially why the cost goes down as the quantity rises. You are spreading the setup time across more product. An ANSI enter and ISO enter would be a completely different mold. Also, color changes require a purge of the press and can be pretty time consuming. Wow! This looks awesome! High-fives for this GB, the website looks very professional. On a related note... My poor wallet. What jdcarpe said. Having ISO included in the base kit was a big discussion at DT and I'm surprised it didn't appear here (I'm not even an ISO person). I'd like to hear Matt3o's reasons because I do believe he was in on the previous conversation. Absolutely. You definitely will need an LZ-GH to compliment this key-set. How can I be sure that I'm getting the right size modifiers? I've ordered a Ducky with MX Greens, and I'm eyeing the keyboard layout and trying to figure out what size is correct. Guessing 1.5 modifiers? Can anyone else with a fullsize Ducky confirm for the newb? Matt3o -- take a bow! 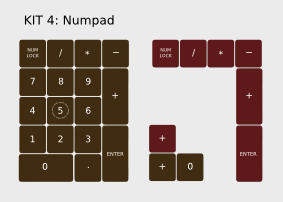 Any chance of adding in a 00 key for the numpad? Possibly interested in a set for the gh60 + 10key whenever those start up but I don't think I'll use a 2.0 size 0 key. Anyway, fantastic concept. I might jump in anyway. The ducky will have 1.25 mods and a 6.25 spacebar. 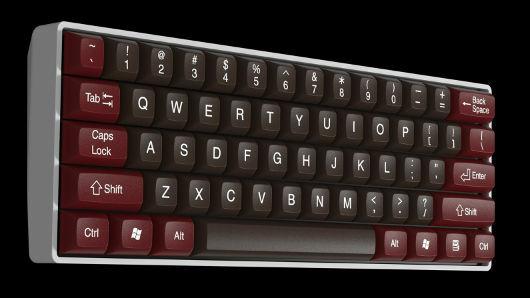 Beautiful looking set, I'd be really into it if there was a Colemak/ blank option, but that is doubtful. I rarely swing by the interest check subforum, either way it's no big deal since the varying sets cover 99% of the bases anyway (which is pretty impressive). can anybody tell me when will this group buy end?